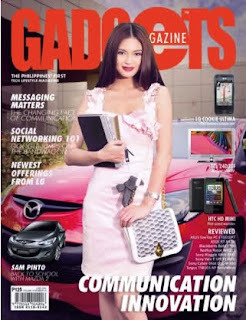 Sam Pinto is the cover girl for this GADGETS June 2011 magazine issue. GADGETS is the Philippines first technology lifestyle magazine, the pioneer tech-lifestyle magazine. Going beyond technology, electronics, and gadgetry. Sam Pinto at the recent fashion show of SM accessories held at One Esplanade. Kapuso Star Sam Pinto graces the cover of ZEN Health Magazine May - July 2011 issue. Sam Pinto attend the First OMG Yahoo Philippines Award and she got 10805 votes for TV personalities award-winning style. Voting still on going. View this site to see female candidates and vote for your female celebrity. Samuelle Lynne Acosta Pinto (born December 11, 1989), popularly known as Sam Pinto, is a Filipino actress and commercial model.